Blockchain – heard about it, don’t understand it? 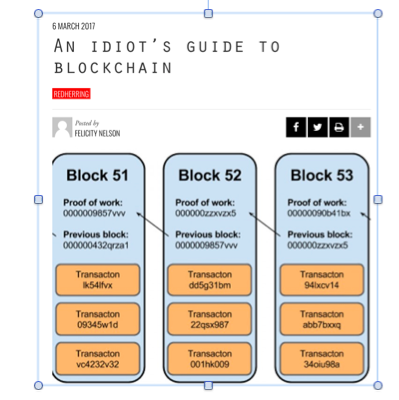 I’ll be honest: I’ve heard quite a bit about blockchain but, until I investigated it for this blog, I didn’t actually know much about what it is, what is does and how it works. However, once I began to dig into the subject, it quickly became clear just how important this is going to be and how a database of blockchain developers may well become the new must-have accessory for IT recruiters. Does that help? No, me neither. Or, in plain English, Blockchain is a very smart way in which any transaction or piece (block) of data can be joined into lots of others along a “chain.” Crucially, all this information sits in a “ledger” that is publicly accessible but virtually impossible to hack into or otherwise fraudulently disrupt. I read that one good way to visualise blockchain is to start by thinking about how you might email a Word Document to another person to ask them to edit it. This started to make sense. Clearly, this way it’s not possible for both people to work on the document together. However, Google Docs does allow two or more people to edit one document at the same time. Think of Google Docs as an extended network where people can work simultaneously and accept or reject every change as it’s proposed. Blockchain takes this networking analogy several stages further, so, for example, you could have an entire recruitment process, with all its communication, interviews, checks, expenses, final selection and onboarding all in one place, accessible publicly across many computers in different locations to those involved but well-nigh impossible for a criminal to access. All these blocks of data are interwoven into a virtually secure system that’s so hard to get into it’s not worth the hackers’ time trying. The key to this impenetrability is that each individual’s access to the chain is unique to them, but even finding any one person’s access details is no use to a cyber criminal because all the blocks are cryptographically linked to each other. This means they all have their own timestamp and unique cryptographic fingerprint (called a hash). Every time someone adds a new piece of information (block) to the chain, they and everyone else in the chain must verify this change. Blockchain technology makes this easy and, once verified, this new block of data has its own fingerprint (hash), but also contains the fingerprint of the previous block, to which it then is inextricably linked. If a criminal tries to get into any block in the chain to change it they would quickly find that this is impossible without altering all the other blocks in the chain – something that they can’t do as it requires everyone else in the chain to verify it - and the amount of computing power to override this is so large that it is not feasible to try. Moreover, at this point it becomes clear that something is wrong and the criminal attempt to gain access is rejected. Or, again in plain words, blockchain is exceptionally secure, much more so than conventional internet technology. That’s one of the reasons why it’s been quickly adopted for crypto-currencies like bitcoin. Blockchain will, I suspect, become central to our future lives in the same way that the internet has become indispensable over the last few decades. And just how that might work in fields other than bitcoin will be the subject of my next blog.